At our next event in Dubspot’s Inspiring Women in Music Technology series, we focus on the business behind marketing music with two female entrepreneurs who are making a difference in the industry today. Join us Wednesday, March 27th, for this exciting discussion and social event, and learn some valuable tips for promoting your own music online and off. 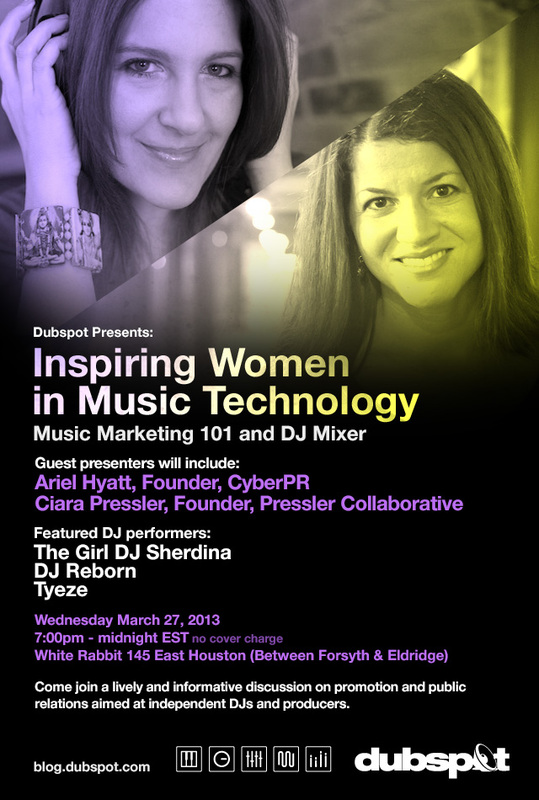 This edition of our event series “Inspiring Women in Music Technology” features two women who are empowering musicians through their marketing and promotion companies, Cyber PR and Pressler Collaborative. Ariel Hyatt, founder of Cyber PR, is a digital PR expert, as well as an author and speaker on the subject. As well as being the founder of a successful PR firm, Hyatt’s bi-weekly newsletter and YouTube series Sound Advice has amassed over 20,000 subscribers and she has penned two successful books on PR and new media: Music Success in Nine Weeks and Musician’s Roadmap to Facebook & Twitter. She has been invited to speak at SXSW, CMJ and ASCAP’s Create Music conference, as well as to create a course for Middle Tennessee State University to teach her approach to music PR. Ciara Pressler is the founder of Pressler Collaborative, and author of Exit Stage Right: The Career Change Handbook for Performers. She consults in PR in other areas outside of the music industry, including real estate, tech, fitness, fashion, film, and beyond. She previously served as Marketing Director for Gen Arts, an organization dedicated to supporting emerging artists in fashion, film, art, and music, as well as Capes Coaching, an entertainment industry career coaching firm. After a discussion of promotion and public relations with our two guests, Dubspot will host a mixer featuring some of our favorite female DJs, with The Girl DJ Sherdina, DJ Reborn and Tyeze setting the tone for the room. The event will take place this time on Wednesday March 27th, from 7pm to midnight at the White Rabbit at 145 East Houston in New York City, between Forsyth and Eldridge. The mission of this series is to foster a supportive environment for women to explore music technology, learn about music production and DJing at Dubspot, and share their experiences. Join us and be a part of a growing movement of energetic and enthusiastic women technologists. These events are intended to help with networking and provide resources and mentoring. Click here to RSVP on the Facebook page for this event.